You can personalize the standard alerts that Dooster sends out. (These are the emails that the system sends out – for example when you assign a task, the person assigned gets an alert / email). Both the subject and body of these can be customized by you with our easy to use tool. Then from the list of Alert types simply select which alert you would like to edit and adjust it accordingly. Preview how the alert will look by selecting the Preview button. Reset the alert to the default / original Dooster version at any time by selecting Reset. These are simple coding devices (sometimes called “Tokens”) that allow you to include things like the users first name – eg Dear Paul” – and so on. …and TASK_SHORT shows a short (5 word) version of either the task subject or description. Simply copy and paste your required marker(s) into your draft if and when you require them. We list all the markers you can use below with a description of what each one does. But don’t worry. The same list is displayed – and easy to find – where you need it, below each edit field. Note: The standard footer showing infomation about the task cannot be removed. TASK_COMMENTS Shows all of the comments for a task. TASK_COMMENT Shows the most recent comment for a task. NOTICEBOARD_PROJECT Shows the project for the associated noticeboard. TASK_DUE Displays the due by date of a task in the user’s local timezone. NOTICEBOARD_EDIT_URL_WITH_SUBJECT Shows the edit url for the associated noticeboard and uses the subject as the link content on the HTML version. USER_FULL_NAME Shows the recipient’s full name, or user name if no first and last name has been provided. 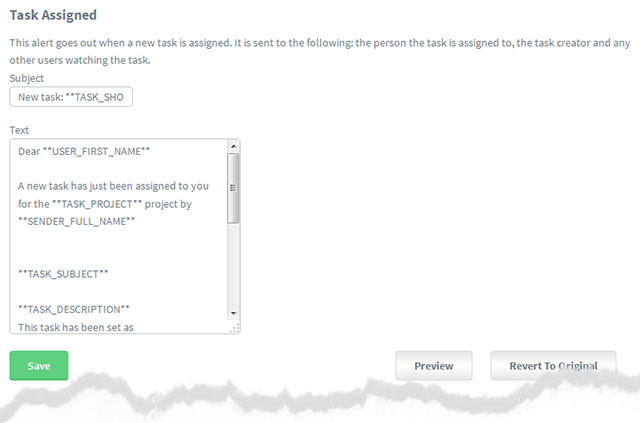 TASK_SHORT Shows a truncated (5 word) version of either the task subject or description. SENDER Shows the username of the current user who initiated the alert, if there is one. NOTICEBOARD_SUBJECT Shows the subject for the associated noticeboard. TASK_EDIT_URL_WITH_NAME Shows a link to this task in it’s tasklist and uses the task name for the link content in the HTML version. TASK_REPLY_EXPECTED Shows the reply expected date for a task. POST_SHORT Shows a truncated version of the post. TASK_COMMENT_USER_FULL_NAME Shows the full name of the user that posted the most recent comment for this task. TASK_PRIORITY Shows the current priority of the task. TASK_PROJECT Shows the project name of the task this notification relates to. TASK_DESCRIPTION Shows the task description. POST_USER_FULL_NAME Shows the full name of the user that created the post. TASK_URGENCY Shows the current urgency of the task. USER Shows the recipient’s user name. TASK_SUBJECT Shows the task subject. NOTICEBOARD_EDIT_URL Shows the edit url for the associated noticeboard. TASK_EDIT_URL Shows a link to this task in it’s tasklist. TASK_IS_DUE Outputs ‘was due’ or ‘will be due’ depending on whether the task is overdue or not. TASK_ASSIGNED_FULL_NAME Shows the full name of the user this task is assigned to. USER_LAST_NAME Shows the recipient’s last name, or nothing if no last name has been provided. NOTICEBOARD_FIRST_POST Shows the content of the first post in the associated noticeboard. SENDER_FIRST_NAME Shows the first name of the current user who initiated the alert, or their username if no first name exists. POST_CONTENT Shows the content of the post. SENDER_LAST_NAME Shows the last name of the current user who initiated the alert, or nothing if no last name exists.POST_PROJECTShows the project the post is attached to. SENDER_FULL_NAME Shows the full name of the current user who initiated the alert, or their username if there is one. NOTICEBOARD_USER_FULL_NAME Shows the full name of the user who created the associated noticeboard. USER_FIRST_NAME Shows the recipient’s first name, or user name if no first name has been provided.